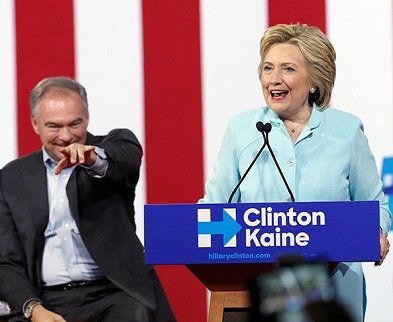 Click here for 25 full quotes from Tim Kaine in the book Kaine press releases. Fix the tax code to help businesses without lobbying clout. Close some gaping loopholes that advantage big corporations. Supported Senate bill to fight opioid epidemic. Comprehensive study of mercury's effect on environment. A clean environment and a strong economy need not contradict. We must protect resources like oyster reefs and clean water. Investments in international development is important to US. It is time to restore freedom to travel to Cuba. Ex-Im Bank funding is not unnecessary corporate welfare. Unfair Chinese trade practices are hurting American workers. Time to rethink Patriot Act. Voting Rights Advancement for marginalized groups. Blocking Supreme Court nominees is a perversion of justice. Pushed for health care for the 9/11 first responders. Do more to expedite transferring Guantanamo detainees out. Help "Blue Water" veterans harmed by Agent Orange. Allow more Syrian Refugees to resettle in US. Supported 2013 Senate immigration reform package. Urges US to accept more Syrian refugees. Investment in broadband for all, to boost economy. Thrilled that a Virginia tribe could pursue casino gambling. Authorize military force against ISIL, phasing out Iraq AUMF. Success in Ukraine means resistance to Russian aggression. Secured funds to help homeless vets find good housing. The above quotations are from Senatorial office and gubernatorial office press releases.